The video game Portal 2 contains an interactive trailer placing the player on board the train before it derails, and showing the carriage being smashed open and the roar of the alien within. The film was released on June 9, 2011, in Australia; June 10, 2011, in the United States; and August 5, 2011, in the United Kingdom. 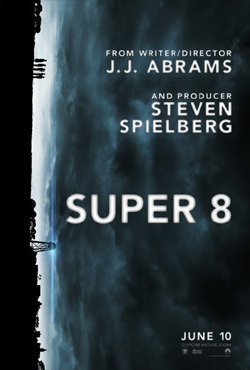 On June 8, Paramount also launched a “Super 8 Sneak Peek” Twitter promotion, offering fans a chance to purchase tickets for an advance screening, taking place on June 9, 2011, in the United States. The film opened at #1 in the U.S. Box Office for that weekend, grossing about $35 million. The film was released on Blu-ray and DVD on November 22, 2011. The release was produced as a combo pack with a Digital Copy, including nine bonus features and fourteen deleted scenes. 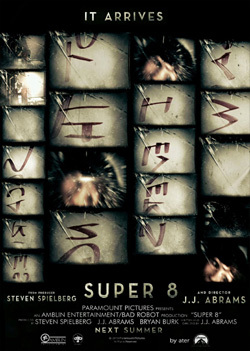 Super 8 received generally positive reviews. On the film-critics aggregator Rotten Tomatoes, the film received a score of 82%, based on 251 reviews, and a rating average of 7.4/10. 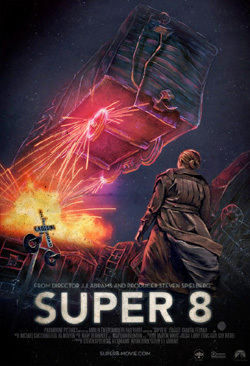 Their consensus: "it may evoke memories of classic summer blockbusters a little too eagerly for some, but Super 8 has thrills, visual dazzle, and emotional depth to spare." Chris Sosa of Gather gave the film an A rating, calling it, "a gripping and exciting tale of finding one's place in the world amidst tragedy". His review concluded, "While the genre-bending occasionally unsettles, the film's genuine and emotionally gripping nature make its journey believable." 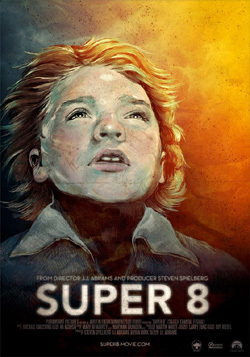 Roger Ebert gave the film 3½ stars out of 4 and said, "Super 8 is a wonderful film, nostalgia not for a time but for a style of film-making, when shell-shocked young audiences were told a story and not pounded over the head with aggressive action. Abrams treats early adolescence with tenderness and affection." Richard Corliss of Time gave it a similarly positive review, calling it "the year's most thrilling, feeling mainstream movie". He then named it one of the Top 10 Best Movies of 2011. Jamie Graham of Total Film gave the film a perfect five-star rating, saying, "like Spielberg, Abrams has an eye for awe, his deft orchestration of indelible images – a tank trundling through a children's playground, a plot-pivotal landmark framed in the distance through a small hole in a bedroom wall – marking him as a born storyteller". Christopher Orr of the The Atlantic called it a "love letter to a cinematic era", while Claudia Puig of USA Today praised it as "a summer blockbuster firing on all cylinders". Critics and audiences alike were polarized on the film's ending. Some found it to be emotional, powerful, and satisfying while others found it rushed and forced. For example, writing for MUBI's Notebook, Fernando F. Croce alleged that "no film this year opens more promisingly and ends more dismally than J.J. Abrams' Super 8." 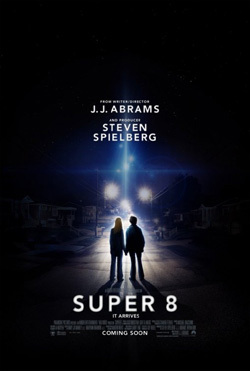 Other critics commented negatively on the film's frequent homages to early works of Spielberg, particularly in its depiction of broken families (a theme Spielberg has explored in nearly all of his films). For example, CNN's Tom Charity felt that "Abrams' imitation was a shade too reverent for his taste." David Edelstein, of New York magazine, called it a "flagrant crib," adding that "Abrams has probably been fighting not to reproduce Spielberg's signature moves since the day he picked up a camera. Now, with the blessing of the master, he can plagiarize with alacrity." 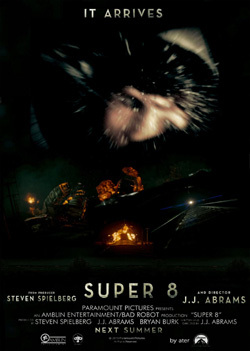 Super 8 had a production budget of $50 million. It was commercially released on June 10, 2011. In the United States and Canada, it opened in 3,379 theaters and grossed over $35.4 million on its opening weekend, ranking first at the box office. The film grossed $127 million in North America with a worldwide total of some $260 million. On Louis and Joe's journey to the town, Louis explains that he came to the Lamb's house after the funeral to apologize. Jackson also admits that he knows that Louis is sorry, and quietly forgives him. Climbing down, Joe and Cary see it leads up into several other places. Eventually, they come across the creature's lair under the town's water tower, which houses all sorts of mechanical parts, including the missing items from the townspeople. As they watch, they see several people strung from the ceiling, including the missing Sheriff, as well as Alice. Before they can rescue her, they catch a glimpse of the creature, who is eating the limb of another human. Fearful that Alice might be next, Joe directs Cary to create a distraction using the fireworks in his backpack. This causes the distraction that Joe needs as the creature heads down the tunnel towards the loud sounds. Joe manages to save Alice, as well as the Sheriff and a woman with rollers in her hair. As they rush to find a way out, they encounter Cary, who thought he was heading towards an exit. Suddenly, the creature comes up behind them, snatching the Sheriff and the other woman into the darkness. Joe, Alice, and Cary run, but are soon at a dead end. The creature has them cornered, but Joe stands before it, reasoning with it. The creature acts hostile at first, but even in the face of its bizarre appearance, Joe does not react hostile like the previous treatment it has known. Suddenly, a sound is heard deep in the cave near the creature's lair, and it puts Joe down before returning. The three return to the surface, and congregate near the water tower. As they do, all sorts of mechanical objects in the area become magnetized to the water tower's top area. Truck trailers nearby that also contained the recovered white cubes burst open, and the cubes begin to form around the edges of the water tower as well. During the spectacle, Jackson and Louis come across their children, and both families reconcile as the creature ascends the watertower. As they watch, the locket in Joe's pocket attempts to fly away. Joe catches it, and we see what was inside it the whole time: a picture of Joe's Mom and him as a baby. Joe finally 'lets go' of his Mom, and the locket flies up to the magnetized watertower, where the metallic objects and the white cubes morph into a spaceship. The creature climbs aboard, as the top of the water tower disappears, raining down its watery contents on the people below. Everyone watches as the ship ascends into the sky. As they do, Joe and Alice hold each other's hands. Extras over the Film Credits: We see that Charles has completed his movie, titled 'The Case.' The Super 8 film consists of a detective investigating a rash of zombie appearances that seem linked to a company called 'Romero Chemicals.' The head of the company denies any wrong-doing, but the detective feels something is amiss. He attempts to send his wife away to keep her safe, but she refuses. While at the train station, they witness a train derailment (the footage captured on their camera replaced by model trains from Joe's collection). The detective soon encounters a doctor who has an antidote to the zombie disease, but only enough for one person. As he attempts to administer it to a captured zombie, the detective watches as the zombie bites into the doctor. After killing the zombified Doctor, the detective returns home, only to find his wife has become a zombie! He stabs her in the neck with the antidote. It appears that it has not worked, and he prepares to kill his wife. However, suddenly she returns to normal, and the two embrace. A final shot shows Charles in a suit and smoking a pipe, thanking the audience for watching, and considering them for the Cleveland film festival...before Alice pops into frame in her zombie make-up, 'terrorizing' the camera lens.